Too often city adventures degenerate into the same old thing....trip to the general store, get some rope, maybe encounter a pick-pocket....yawn.... Armed with City Slices a GM can make the city come alive! City Slices I focuses on the bustling fun of a marketplace and includes tons of items to buy, npcs, skill challenges, poisons, a new weapon (two-weapon rangers are gonna love it! ), food vendors, and tons more! The fluff can be used in any fantasy rpg but 4e D&D fanatics will get the most mileage out of this product. The entire product has headers, footers, a hyperlinked table of contents, index, and loads of illustrations to make navigation a breeze and reading enjoyable! Here's what Neuroglyph Games has to say, "The writing is inventive and descriptive, but is designed generically enough to allow Dungeon Masters to mold it neatly into their own campaign style. 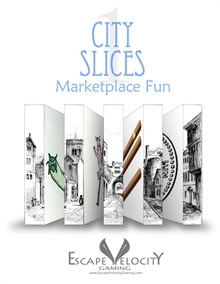 And given the amount of material provided for the price, City Slices I: Marketplace Fun is worth taking a look at as an inexpensive and amusing supplement for a DM's virtual bookshelf." This title was added to our catalog on December 19, 2010.